Fathom Five National Marine Park, Ontario. Today dawned bright and sunny and as well as taking a boat tour out to Flowerpot Island, we wanted to spend some time to explore Tobermory and the area, so it couldn't have been more perfect. We headed out from Cyprus Lake campground in the Bruce Peninsula National Park towards the town of Tobermory to make reservations on the Great Blue Heron - a glass bottom tour boat which would take us out to Flowerpot Island in the Fathom Five National Marine Park. With tickets secured, we headed to the new multi million dollar National Park Visitor Centre to find out about the destination and to climb the 20 metre tower for a panoramic view over the forest canopy and the islands of Fathom Five. The centre itself houses a walk through gallery which explains everything from the creation of the two parks (Bruce Peninsula National Park and Fathom Five), the geological features, wildlife, and the natural and cultural history of the area. We headed up the 20 metre high tower and took a 20 minute breather at the top for the panoramic view - it seems we are a little out of shape!! Soon it was time to head back into town, we'd booked the 1:30pm boat tour and had to park the camper at the general visitor centre in town and walk 5-10 minutes with the equipment to the dock. Fathom Five was Canada's first National Marine Park established in 1987. 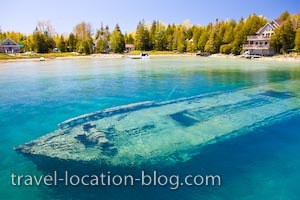 It is home to 22 known shipwrecks and with it's crystal clear waters it is a popular diving and snorkeling destination. There are 22 islands in the park which covers an area of 112 square kilometres but only one has basic facilities and that is Flowerpot Island - our ultimate destination for today.